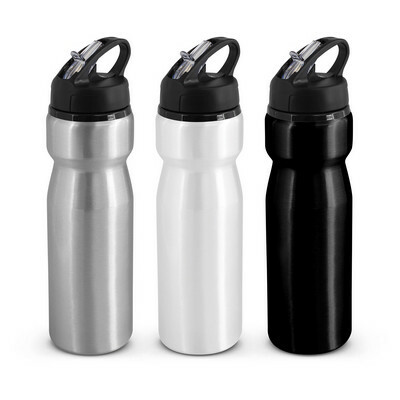 750ml food grade stainless steel drink bottle which is BPA free and has a choice of three different lid styles. 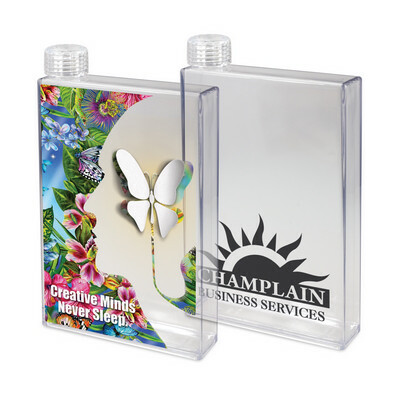 It is designed specifically for stunning, diswasher safe, full colour wrap around branding. 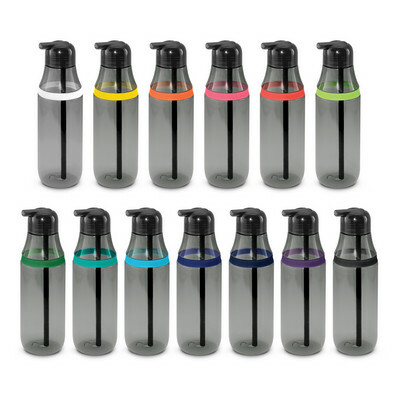 Eco Safe: Stainless steel does not require a plastic liner ensuring a chemical and odour free beverage. 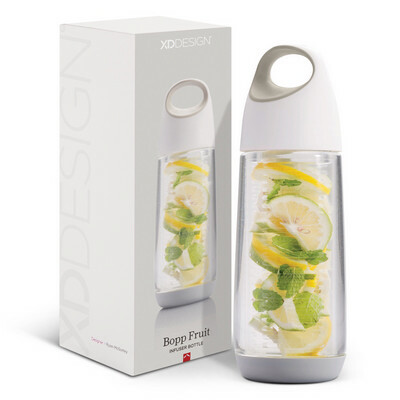 Has an indefinite life span which keeps your logo in the public arena longer and also helps to limit the use of disposable plastic bottles that can end up polluting the environment. 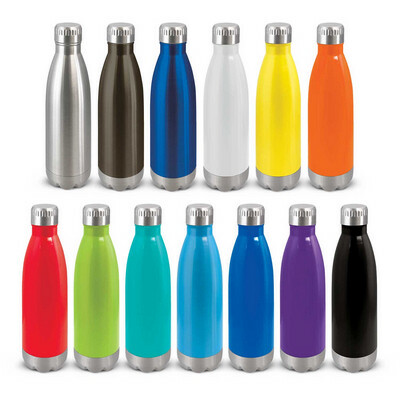 All materials used are recyclable and BPA free. Colours: White. Dimension: Dia 75mm x H 275mm. Print Description: 165mm x 220mm. Print Type: Sublimation Print. Packing: Loose packed or an optional gift box. 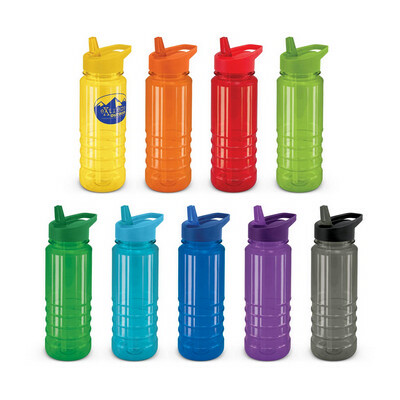 The carabineer is inclusive with the carabineer lid and additional for the sipper lid and flip valve lid. 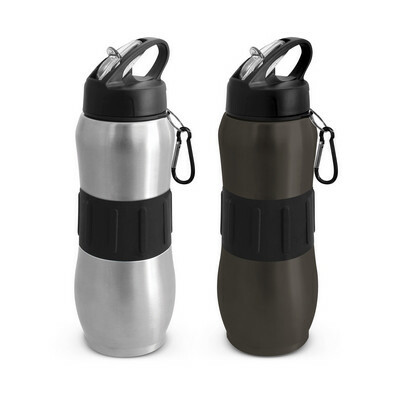 Ergonomically designed 830ml stainless steel drink bottle with a leak proof flip cap which has a stylish carry handle. 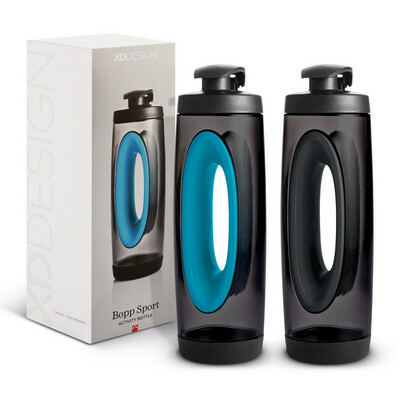 Magnum also features a smart soft touch silicone band and a handy carabiner. It is supplied in a Black gift box and engraves to a natural etch. Eco Safe: Stainless steel does not require a plastic liner ensuring a chemical and odour free beverage. It has an indefinite lifespan which keeps your logo in the public arena for longer and also helps to limit the use of disposable plastic bottles that can end up polluting the environment. 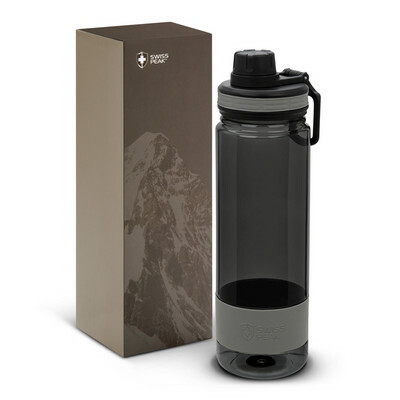 All materials used are recyclable and BPA free. Colours: Gunmetal, Silver. Dimension: Dia 84mm x H 252mm (excluding carabiner). Print Description: 30mm x 12mm (top) . Print Type: Pad Print. Packing: Gift box. 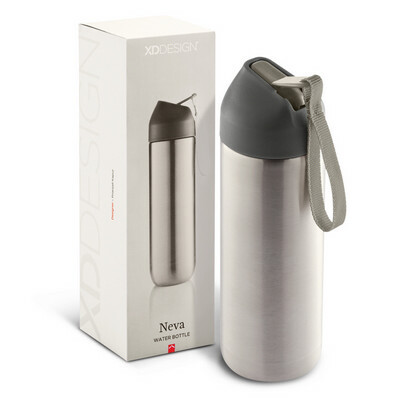 Large 900ml stainless steel drink bottle which features a secure screw on lid with a carry handle. 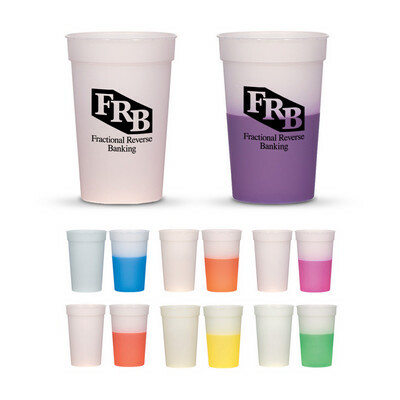 The lid also features a silicone outer ring for improved grip and the option of adding a smart full colour resin coated logo on the top. 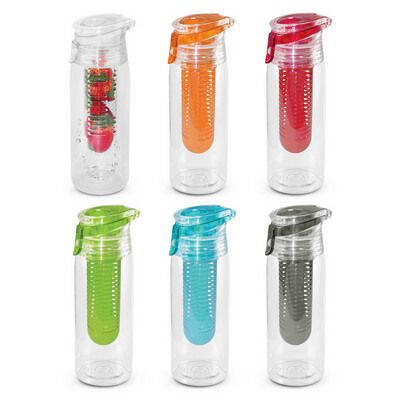 Primo has an extra large bottle opening which is ideal for adding ice cubes. 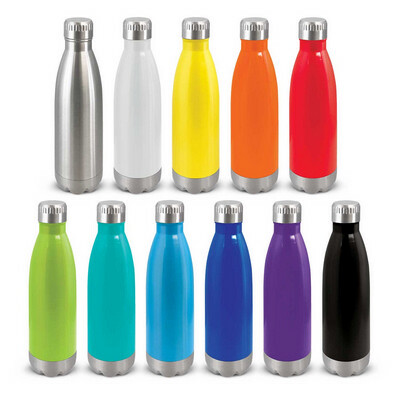 Eco Safe: Stainless steel does not require a plastic liner ensuring a chemical and odour free beverage. It has an indefinite lifespan which keeps your logo in the public arena for longer and also helps to limit the use of disposable plastic bottles that can end up polluting the environment. 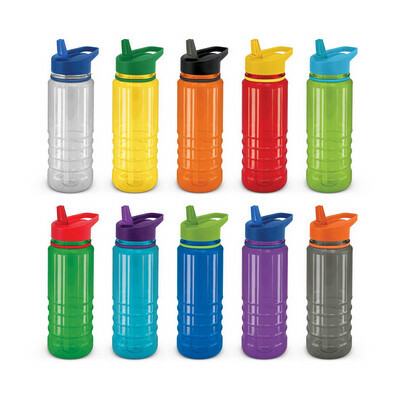 All materials used are recyclable and BPA free. 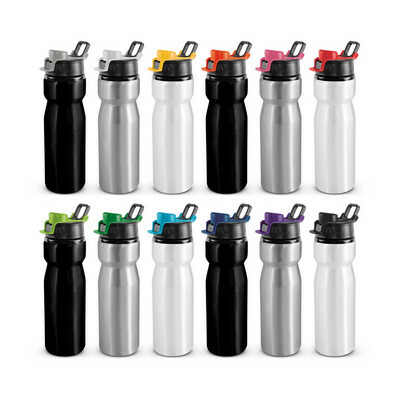 Colours: Bottle: Silver, White, Black. Dimension: Dia 79mm x H 260mm x 105mm. 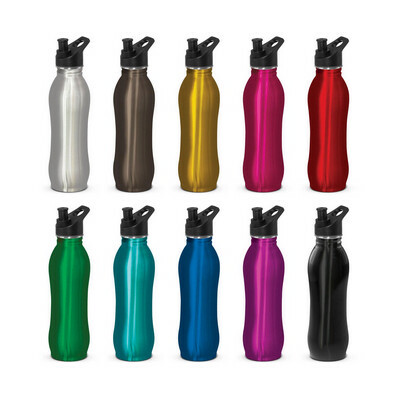 Print Description: Bottle: 40mm circle. Print Type: Pad Print. Packing: Loose packed. 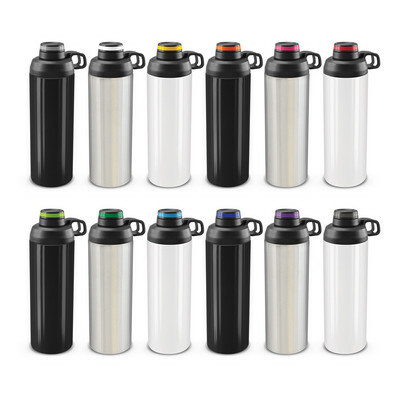 Eco Safe: Stainless steel does not require a plastic liner ensuring a chemical and odour free beverage. 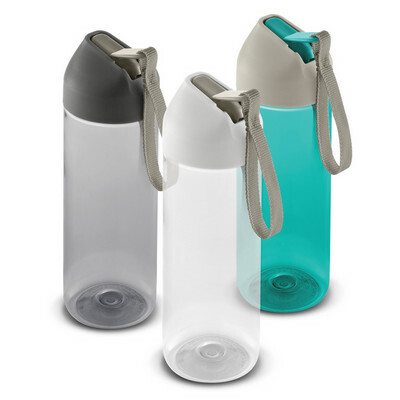 It has an indefinite lifespan which keeps your logo in the public arena for longer and also helps to limit the use of disposable plastic bottles that can end up polluting the environment. 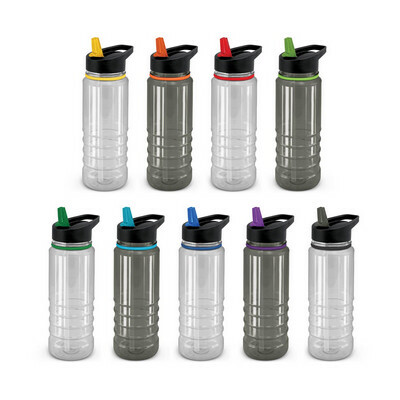 All materials used are recyclable and BPA free. Colours: White, Yellow, Orange, Red, Bright Green, Light Blue, Dark Blue, Black. Dimension: Bottle: Dia 73mm x H 257mm. Print Description: 40mm x 60mm. Print Type: Pad Print. Packing: Loose packed or an optional gift box. 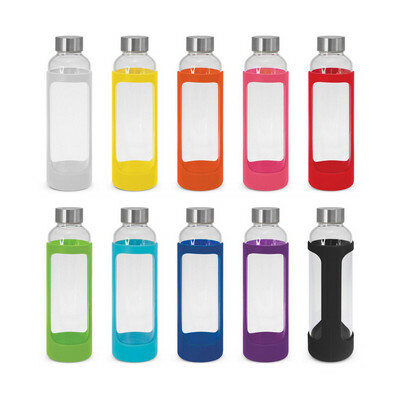 600ml borosilicate glass drink bottle which features a protective soft touch silicone sleeve and a secure screw on stainless steel lid that can be laser engraved with a logo. 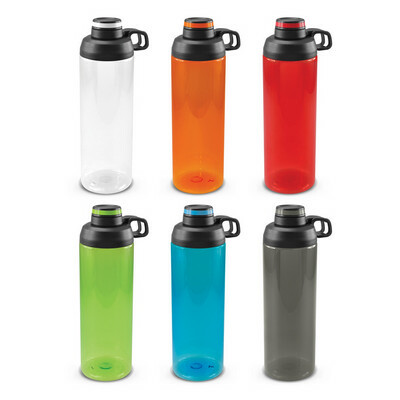 Borosilicate is a lightweight glass which is exceptionally strong and shatter resistant. Glass is a natural choice for a clean, pure taste and it offers a safe and eco-friendly alternative. 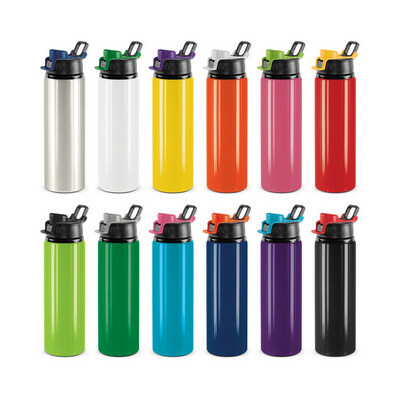 Colours: White, Yellow, Orange, Pink, Red, Bright Green, Light Blue, Dark Blue, Purple, Black. Dimension: Dia 67mm x H 238mm. Print Description: 50mm x 40mm. Print Type: Pad Print. Packing: Individual boxes.